The Ferrari Monza SP1 is displayed in Maranello, Italy, Tuesday, Sept. 18, 2018. Ferrari has debuted two new road cars, claiming they are fitted with the most powerful engine ever built by the Italian car maker. 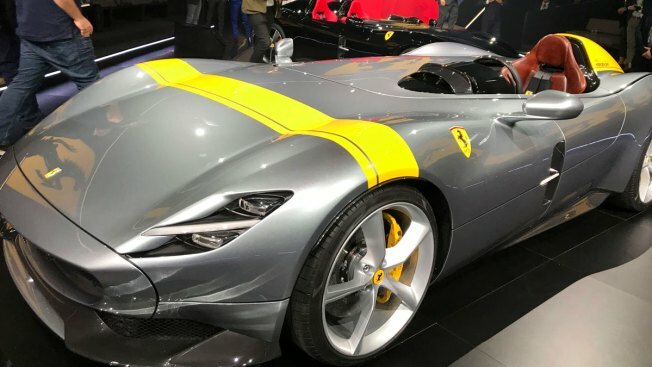 The luxury sports car maker took the wraps off the Ferrari Monza SP1 and SP2 at the firm's famous Maranello factory in Italy on Tuesday. Ferrari said in a press release that the latest models are first in a limited series called "Icona". The name has been chosen to reference the firms famous racing cars of the 1950's. The SP1 has only one seat while the SP2 allows for one passenger. The firm said the V12 810 brake horse power engine housed in both models is the most powerful motor drive ever built at Maranello. Other official statistics published by the firm said either car can reach 100 kilometres per hour (62 mph) in 2.9 seconds. Ferrari said the limited edition would run to a maximum of 500 cars. The Monza's bodyshell is built entirely from carbon fibre and neither model comes with a roof or windscreen. Ferrari said a "virtual wind shield" is placed behind the instrumentation panel to push air flow above the driver who is sat in a Formula 1 style cockpit. The cars were unveiled at the end of the firm's first capital markets day since the passing of former CEO Sergio Marchionne. Shares in the supercar maker see-sawed after the company announced a new earnings target range for 2022 of between 1.8 and 2 billion euros ($2.1 -2.3bn). That represents a pull back from the 2 billion euro target put in place by Marchionne but new boss Louis Camilleri described it as "ambitious but doable."